West of the cathedral is La Profesa, or the Church of San Felipe Neri El Nuevo. 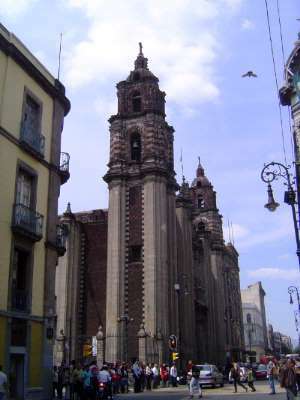 A church built here in 1595 was the stronghold of the Jesuits in Mexico, but it was destroyed by a flood in 1629 and rebuilt in 1720 by Pedro de Arrieta. When the Jesuits were expelled from Spain in 1767, the church passed to the government and then to the order of San Felipe Neri. That order's previous church had been destroyed by an earthquake in 1768, which is why this church is called "the new." The Jesuits regained possession in 1802, but reform laws later that century forced their abandonment of the adjoining monastery, which was demolished in 1862 to make way for Calle de Cinco de Mayo, at the far side of the church.